These Cute and Comfy Buckle Sandals are absolutely perfect for all occasions! 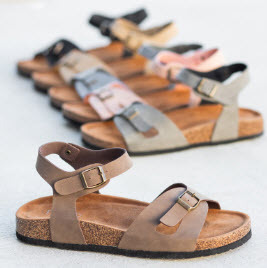 Made with faux nubuck leather and features an open toe, cute ankle buckle accents, comfy cushioned insoles, adjustable ankle straps, and comes in a variety of trendy colors. You can dress them up with a skater dress or dress them down with a pair of boyfriend jeans and a casual bodysuit tank.